I’ve been enjoying my summer so much that I’ve hardly talked about any books. Or read many, for that matter. Last year I read 356 books, and as of this morning I’m only up to 192 this year. That’s a long way to go to beat last year’s record, so I decided it’s time to face the music and think about books again. Thinking about books means thinking about work, which means thinking about going back to work. So you can see why my brain resists. So I decided to go back and start reviewing some of the books I’ve read this year but never mentioned. 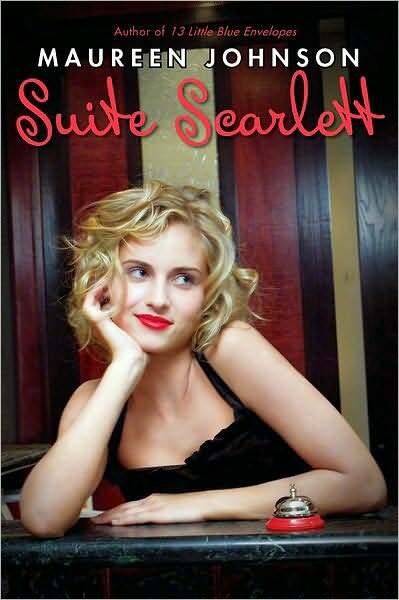 First up is Maureen Johnson’s Suite Scarlett. I picked this one for today because it takes place in New York City during the summer, and the timing seemed good. The sequel to this book, Scarlett Fever, is due out in February. And I’m excited for the sequel because I must say, I was sad to leave these characters when the book was over. Scarlett is a teenage girl living in the Hopewell Hotel in Manhattan. Her family runs the hotel, and every time one of the kids turns 15 they’re given a suite to take care of. It’s now Scarlett’s turn to get her suite, and Scarlett’s quiet summer is turned upside down when the eccentric and wealthy Mrs. Amberson shows up and moves into Scarlett’s suite for the summer. Mrs. Amberson is over-the-top and loves to meddle in Scarlett’s life, which includes tricky sibling relationships, a crush on an older boy, and the financial troubles of the family business. This is a great New York comedy. I think of the characters as real people, and I actually caught myself wondering what they were up to long after I’d finished listening to the audio book (with a wonderful performance by Jeannie Stith). It reminded me of the quick-witted movies of the 1940s and 1950s, with outrageous scenarios and charmingly crazy characters. Scarlett is resourceful and incredibly patient with Mrs. Amberson’s antics, which lends the book it’s madcap quality. But her relationships with her brother and sisters are real and surprising. There are a few subplots which absolutely push the bounderies of believability, even for a comedy, but it’s all tied together in such a no-harm-done way that I couldn’t get enough. I loved Maureen Jonhson’s 13 Little Blue Envelopes, and this book sealed her in as one of my favorite YA authors writing today.